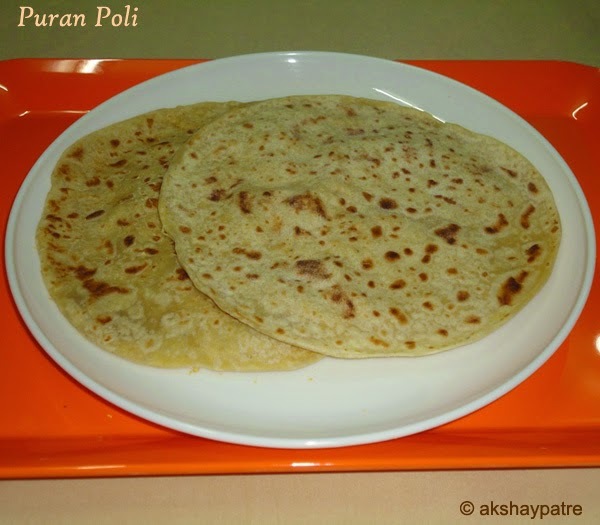 Puran poli recipe - Puran poli is a popular Indian stuffed sweet paratha, which is called with different names in different parts of India. 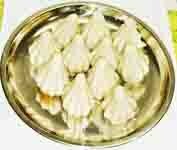 It is prepared on the occasion of festivals such as Gudi Padwa (Ugadi), Holi, Ram navami etc. It is made by using wheat flour, all purpose flour, bengal gram and jaggery. It goes well with katachi amti, ghee and milk. 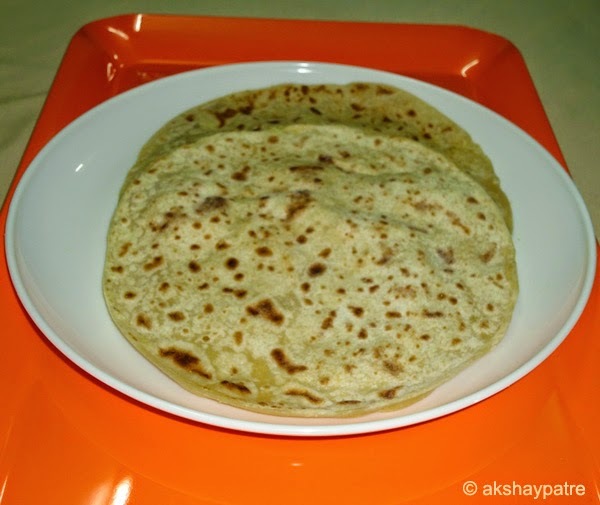 Usually, dough for puran poli is made of using wheat flour only. But you can use all purpose flour and wheat flour together to have an attractive appearance as done by me in this recipe. 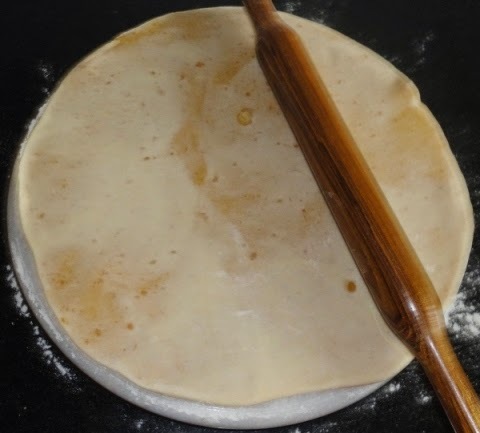 If maida is used along with wheat flour it is also easy to prepare puran poli because of it's elasticity. However, using wheat flour is an healthier and tastier option though it is a bit tedious to prepare using wheat flour only. While cooking chana dal, take some cooked chana dal in a plate and press it with your finger tips. If it is easily pressable and mashable the dal is cooked. 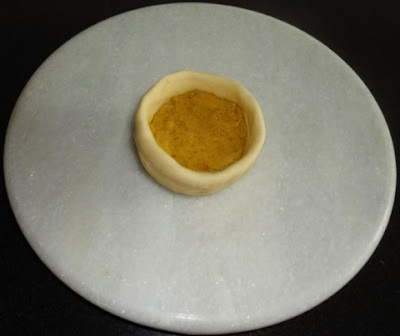 When jaggery is added, it melts and continuous stirring is needed till the mixture dries and form a lump. While grinding the dal mixture in mixer, grind it in small batches, on a low speed, for a few seconds, fluff it with spoon and repeat the process several times. 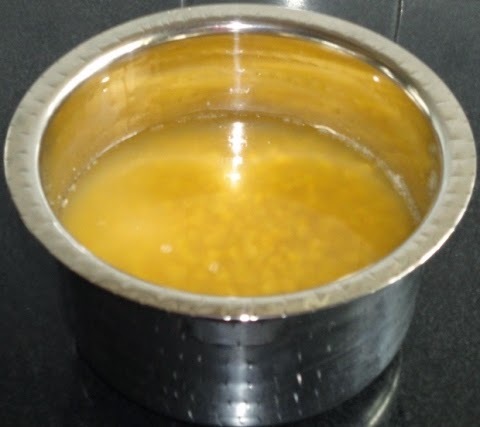 You can also use puran maker which is available in the market to churn the dal mixture. 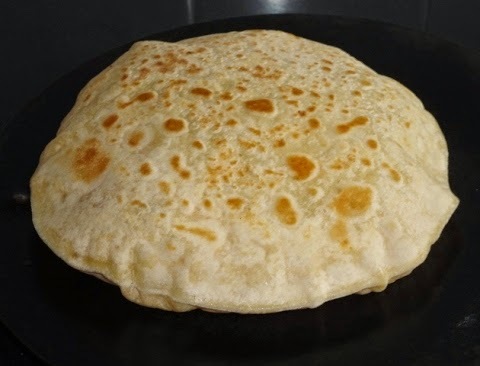 If you feel that preparation of puran poli is very tedious, but you want to eat, you can prepare puran and chapatis separately and eat them together along with some ghee and milk. Wash and soak the chana dal overnight or 7 -8 hours. After 7 hours, drain the water and set aside. Boil 6-7 cups of water in a heavy bottomed vessel and add the chana dal. Cook it over medium heat until soft. Once the chana dal become soft, drain the water and reserve it to make the katachi amti. Add the grated jaggery to the boiled and drained chana dal and mix well. Place this vessel of the dal mixture over a low flame. 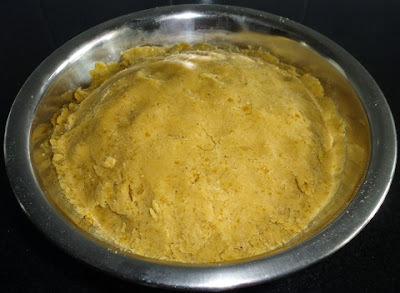 Once the jaggery melts, stir continuously and cook till the dal mixture slightly dries up and turns into a lump. Remove from the flame, add cardamom powder and allow it to cool. When it cools, grind the dal mixture into a mixer or puran maker, filling the mixture above the blade to a smooth and soft paste without adding any water. Grind in batches. (Keep aside 4 tbsp of puran to make katachi amti). Transfer the pooran to a bowl and set aside. In the meanwhile, mix the wheat flour and maida, add salt and knead it to a smooth and firm dough, using some water. Cover with lid and keep it aside for 30 minutes. 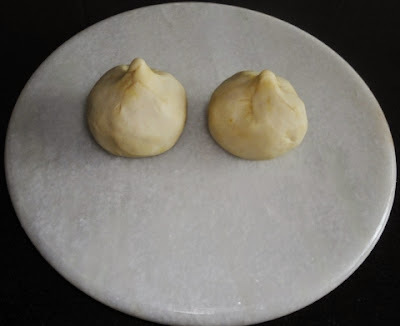 Take a large lemon sized dough and make a round shape ball, using the palms of your hands. Flatten this ball and stuff puran upto 3/4 part. Further lift the edges and join it at top. Twist the tip and flatten it. Dust the rolling board with wheat flour and roll the above prepared stuffed dough into round shape using chapathi roller pin. Roll as thin as possible. Heat a pan over a medium low heat and place the puran poli over it gently. Roast the puran poli till the light brown colour spot appears from both sides. Remove and serve the puran poli hot or cold with ghee, milk and katachi aamti. It can be stored in the refrigerator for about a week. 1. Wash and soak the chana dal overnight or 7 -8 hours. After 7 hours, drain the water and set aside. 2. Boil 6-7 cups of water in a heavy bottomed vessel and add the chana dal. Cook it over medium heat until soft. 3. Once the chana dal become soft, drain the water and reserve it to make the katachi amti. 4. Add the grated jaggery to the boiled and drained chana dal and mix well. 5. Place this vessel of the dal mixture over a low flame. 6. 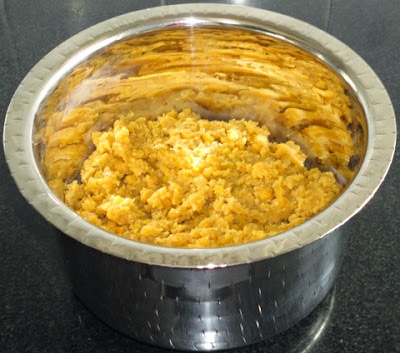 Once the jaggery melts, stir continuously and cook till the dal mixture slightly dries up and turns into a lump. 7. Remove from the flame, add cardamom powder and allow it to cool. 8. When it cools, grind the dal mixture into a mixer or puran maker, filling the mixture above the blade to a smooth and soft paste without adding any water. Grind in batches. (Keep aside 4 tbsp of puran to make katachi amti). 9. Transfer the pooran to a bowl and set aside. 10. In the meanwhile, mix the wheat flour and maida, add salt and knead it to a smooth and firm dough, using some water. 11. Cover with lid and keep it aside for 30 minutes. 13. Further lift the edges and join it at top. Twist the tip and flatten it. 14. 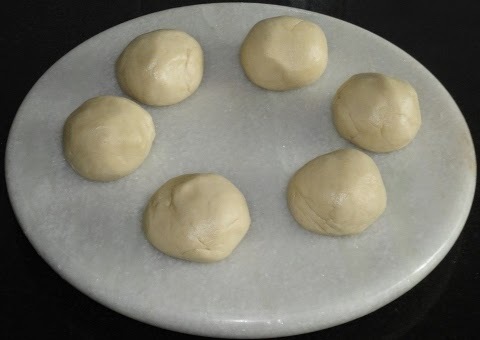 Dust the rolling board with wheat flour and roll the above prepared stuffed dough into round shape using chapathi roller pin. Roll as thin as possible. 15. Heat a pan over a medium low heat and place the puran poli over it gently. 16. Roast the puran poli till the light brown colour spot appears from both sides. 17. Remove and serve the puran poli hot or cold with ghee, milk and katachi aamti. It can be stored in the refrigerator for about a week. looks so delicious and mouthwatering. Lovely and delicious puran poli, I love the poli's. Thanks for sharing. Hi Vidya, your rotis look delicious. Great to go with any curry. it has fluffed up so well, quite a treat to eyes and tummy. Beautiful and droolworthy puran poli.